We provide professional leadership skills training throughout the UK which can be tailored to meet your leadership development training requirements. Please feel free to take a look at our courses and how our leadership courses can help you and your company by clicking the link below. Looking For An On-Going & Modular Management Or Leadership Development Programme? You already appreciate that the quality of your managers will be a vital ingredient for your company to be able to grow and move forward. An on-going management or leadership development programme will provide your managers with the ability to improve their managerial skills and at the same implement what they are learning as they go. Our leadership training courses are completely bespoke and can include workshop based learning along with a whole other set of learning and development activities (see below for some examples). Your managers need to be challenged to take their skills to the next level and our programmes are always fun, practical and contain a good mixture of the fundamentals of management as well as the advanced strategies. We will first understand your requirements and the current skill levels and experience of your managers and we will then work with you to design the right management development programme for you – no two programmes are the same. We are an ILM Centre (Institute of Leadership & Management) so we can also offer you formal accredited qualifications for all levels. You don’t have to offer a qualification but it’s an option should you need it. What can a management development programme include? It doesn’t have to be just workshops! 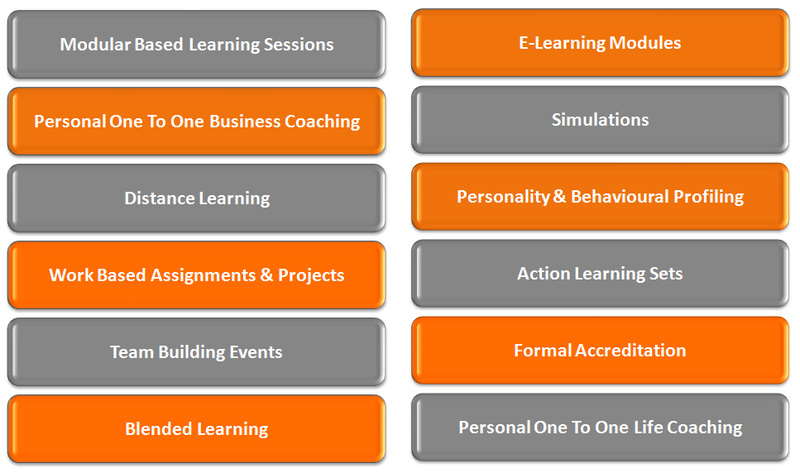 Below are some examples of the activities and what we have included in our programmes. The structure and the fit for your organisation has to be right and we will take that into consideration when designing a programme with you.